This article is about a series of amateur-satellites. For other uses, see Oscar (disambiguation). An amateur radio satellite is an artificial satellite built and used by amateur radio operators for use in the Amateur-satellite service. These satellites use amateur radio frequency allocations to facilitate communication between amateur radio stations. Many amateur-satellites receive an OSCAR designation, which is an acronym for Orbiting Satellite Carrying Amateur Radio. The designation is assigned by AMSAT, an organization which promotes the development and launch of amateur radio satellites. Because of the prevalence of this designation, amateur radio satellites are often referred to as OSCARs. These satellites can be used free of charge by licensed amateur radio operators for voice (FM, SSB) and data communications (AX.25, packet radio, APRS). Currently, over 18 fully operational amateur-satellites in orbit act as repeaters, linear transponders or store and forward digital relays. Throughout the years, amateur-satellites have helped make breakthroughs in the science of satellite communications. A few advancements include the launch of the first satellite voice transponder (OSCAR 3) and the development of highly advanced digital "store-and-forward" messaging transponder techniques. The first amateur satellite, simply named OSCAR 1, was launched on December 12, 1961, barely four years after the launch of world's first satellite, Sputnik I. The beginning of this project was very humble. The satellite had to be built in a very specific shape and weight, so it could be used in place of one of the weights necessary for balancing the payload in the rocket stage. 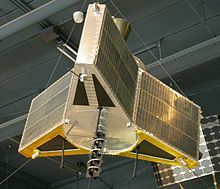 OSCAR 1 was the first satellite to be ejected as a secondary payload (with Discoverer 36 as the primary) and subsequently enter a separate orbit. The satellite carried no on-board propulsion and the orbit decayed quickly. Despite being in orbit for only 22 days, OSCAR 1 was an immediate success with over 570 amateur radio operators in 28 countries forwarding observations to Project OSCAR. Most of the components for OSCAR 10 were "off the shelf" and tested by group members. Jan King led the project. Solar cells were bought in batches of 10 or 20 from Radio Shack and tested for efficiency by group members. The most efficient cells were kept for the project, the rest were returned to RadioShack. Once ready, OSCAR 10 was mounted aboard a private plane and flown on a couple of occasions to evaluate its performance and reliability. Special QSL cards were issued to those who participated in the airplane based flights. Once it was found to be operative and reliable, the satellite was shipped to Kennedy Space Center where it was mounted in the third stage of the launch vehicle. Height: 1.35 m (53 in) Width: 2.0 m (78.75 in) Weight: 140 kg (at launch), 90 kg (after engine firings, 198 lbs). Other programs besides OSCAR have included Iskra (Soviet Union) circa 1982, JAS-1 (Fuji-OSCAR 12) (Japan) in 1986, RS (Soviet Union and Russia), and CubeSats. (There is a list of major amateur satellites in Japanese Wikipedia). The first amateur satellites contained telemetry beacons. Since 1965, most OSCARs carry a linear transponder for two-way communications in real time. Some satellites have a bulletin board for store-and-forward digital communications, or a digipeater for direct packet radio connections. Amateur satellites have been launched into low Earth orbits and into highly elliptical orbits. Currently amateur-satellites support many different types of operation including FM voice, SSB voice, as well as digital communications of AX.25 FSK (Packet radio) and PSK-31. Prior to the launch of OSCAR 40, operating modes were designated using single letters to indicate both uplink and downlink bands. While deprecated, these older mode designations are still widely used in casual conversation. Due to the high orbital speed of the amateur-satellites, the uplink and downlink frequencies will vary during the course of a satellite pass. This phenomenon is known as the Doppler effect. While the satellite is moving towards the ground station, the downlink frequency will appear to be higher than normal. Hence, the receiver frequency at the ground station must be adjusted higher' to continue receiving the satellite. The satellite in turn, will be receiving the uplink signal at a higher frequency than normal so the ground station's transmitted uplink frequency must be lower to be received by the satellite. After the satellite passes overhead and begins to move away, this process is reversed. The downlink frequency will appear lower and the uplink frequency will need to be adjusted higher. The following mathematical formulas relate the doppler shift to the velocity of the satellite. A number of low earth orbit (LEO) OSCAR satellites use frequency modulation (FM). These are also commonly referred to as "FM LEOs" or the "FM Birds". Such satellites act as FM amateur radio repeaters that can be communicated through using omni-directional antennas and commonly available amateur radio equipment. Due to the relative ease of tuning FM as compared to SSB and the decreased distance of LEO satellites from earth stations communication can be achieved even with handheld transceivers and using manual doppler correction. The orbit of these satellites however causes the available time in which to communicate to be limited to only a few minutes per pass. Note 1: SO-67 suffered[when?] a power board failure. The team hoped (2012) recovery to amateur radio operations was possible. Note 2: As of November 29, 2011 AO-51 has ceased all transmissions. Note 3: The ISS FM repeater is rarely activated. Note 4: New bootloader and OS for AO-27 was successfully written and installed by the team. Satellite experiences interference during uplink while above US. Note 5: The AO-16 downlink transmits in DSB-SC instead of FM, but the satellite otherwise operates like the other FM Birds. Note 6: EO-80 is currently[when?] completing a science mission and the FM transponder will be activated upon completion of that mission. Note 7: As of 2019-02-12, AO-85 is turned off due to poor battery condition and low voltage during eclipse periods. The names of the satellites below are sorted in chronological order by launch date, ascending. The status column denotes the current operational status of the satellite. Green signifies that the satellite is currently operational, orange indicates that the satellite is partially operational or failing. Red indicates that the satellite is non operational and black indicates that the satellite has re-entered the Earth's atmosphere. The country listing denotes the country that constructed the satellite and not the launching country. IRSHSAT-1 - A cubesat is being built by the students at Pakistan Student Satellite Program. Launch Date sometime in 2011. BLUEsat - A microsatellite built by the students of The University of New South Wales. Unknown launch date. The next test will be in April 2014 when it is flown from a stratospheric weather balloon. 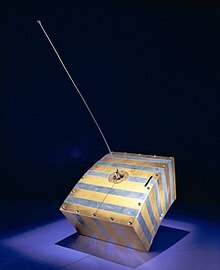 ZSAT - A microsatellite initiated and funded by the U.S. Department of Science and Technology[clarification needed]. Unknown launch date. AMSAT-Phase 3E - A satellite built by AMSAT. Delayed Indefinitely. KiwiSAT - A microsatellite built by AMSAT-ZL. Scheduled to launch from mid to late 2009. 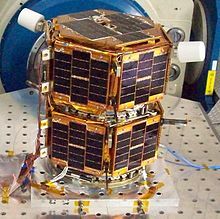 ESEO - A microsatellite built by SSETI. Scheduled to launch in 2015-2016. AMSAT-Eagle - A satellite built by AMSAT. Cancelled. Delfi-n3Xt - The second nano-satellite from Delft University of Technology. Launched the 21 November 2013. Fox-1 - Five 1u cubesats from AMSAT-NA. Three in orbit and functioning, known as AO-85 (Fox-1A), AO-91 (Fox-1B), and AO-92 (Fox-1D). Fox-1Cliff (formerly Fox-1C) is awaiting launch and Fox-1E is in development. SuitSat, an obsolete Russian space suit with a transmitter aboard, is officially known as OSCAR 54. In a twist of fate, "Oscar" was the name given to an obsolete space suit by its young owner in the book Have Space Suit—Will Travel, by Robert A. Heinlein. This book was originally published a year after the launch of the first artificial satellite (Sputnik). This section may need to be cleaned up. It has been merged from Amateur-satellite service. amateur-satellite service is limited to the Earth-to-space direction. Of these, the 435-438 MHz band is particularly popular for amateur/educational small satellites such as Cubesats. ^ "FM Satellite Frequency Summary". ^ "OSCAR Number for LituanicaSAT-1". ^ "SA AMSAT". Southern African Amateur Radio Satellite Association. Retrieved 2012-08-09. ^ "AMSAT AO-51 Control Team News". AO-51 Command Team and Operations Group. Archived from the original on 2007-10-31. Retrieved 2012-01-15. ^ "ISS Fan Club". ISS Fan Club. Retrieved 2011-07-27. ^ "AO-85 Turned Off due to Return of Eclipse Periods and Poor Battery Condition". American Radio Relay League. Retrieved 2019-02-12. ^ "VO-52 "Hamsat" end of mission". AMSAT. ^ "AO-85 (Fox-1A) – AMSAT-NA". www.amsat.org. Retrieved 2018-02-14. ^ "RadFxSat (Fox-1B) Launched, Designated AMSAT-OSCAR 91 (AO-91)". AMSAT-UK. 2017-11-18. Retrieved 2018-02-14. ^ "Fox-1D Launched, Designated AMSAT-OSCAR 92 – AMSAT-NA". www.amsat.org. Retrieved 2018-02-14. Martin Davidoff: The Radio Amateur's Satellite Handbook. The American Radio Relay League, Newington, ISBN 978-0-87259-658-0. "Space Satellites from the World's Garage -- The Story of AMSAT". The Radio Amateur Satellite Corporation. Archived from the original on 2006-10-05. Retrieved 2006-09-05. "The Extraordinary History of Amateur Radio Satellites". Space Today Online. Retrieved 2006-09-05. "A Brief History of Amateur Satellites". N7HPR. Archived from the original on August 23, 2006. Retrieved 2006-09-05. "Satellite Development Programs". The Radio Amateur Satellite Corporation. Retrieved 2006-09-05. "Amateur (ham) Radio Satellites". Colorado State University. Archived from the original on 2006-08-31. Retrieved 2006-09-07. Wikimedia Commons has media related to Amateur radio satellites.